Could you, please, refactor it to use UsageMonitor? I was experiencing RainMeter crashes after enabling pagefile monitoring. Last edited by balala on December 5th, 2018, 1:00 pm, edited 1 time in total. Oh dang, thanks for pointing that out! I wonder whats up with the 100%, is it the current r/w ? Is this supposed to be normal or a bug? After you do this, reboot your PC and all should be working properly. Really love this! And the latest beta added some nice touches like the ability to scale the size. What would it take to add a PSU meter as well? I have a Corsair PSU and HWinfo can poll it via USB connection. 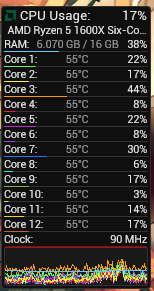 Would be nice to get something like the GPU meter but with Watts in and out, efficency, and maybe graph. There are other bits of data like rail voltage and amperages that can be polled as well, but I am not sure those are really needed. I would be willing to provide any details you need to help.